After five weeks of talking and training, we’re bringing the fruity loaves of our labours to your tables. This is the first week of the Just Bread subscription and your first chance to taste some of the beautiful bread we’ve been baking. 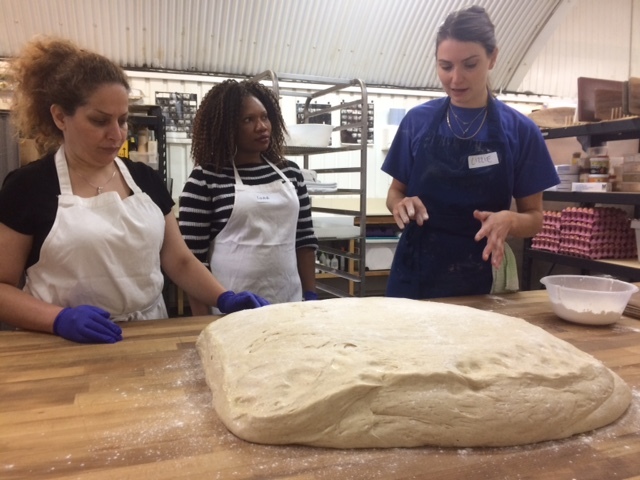 We’re not only learning the intricacies of baking with sourdough, but also practising systems for working cooperatively, with the alchemy of flour, water and salt and a certain amount of baker’s intuition. Today in exchange for our efforts, we’ve prepared 250 steaming flatbreads which are on their way to you this evening. Bread raises questions and conversations around this table. We eat warm multigrain toast and jam for breakfast, blanketed in crunchy seeds and grains, Seferina and Yordanos compare the differrent ways they used linseeds in their own kitchens in Ethiopia and Sudan – in sauces and stews. We eat bean and cabbage soup, dunking crusts of country loaf, while Loveth shares recipes for fried black eyed bean cakes, sometimes with an egg inside. Today the E5 bakers remind us that baking slowly and with passion is a process and pitfalls are the backbone of any baker’s journey. Like this flatbread recipe, you just have to try it and see.